Over the centuries, men have waxed loquaciously about Hell…in Greek mythology Hades ruled the Underworld, which was a foul, scary place. 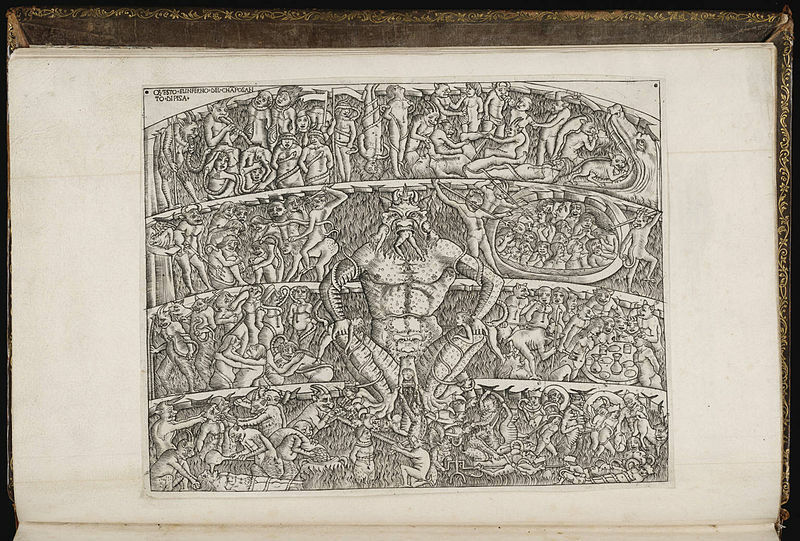 Dante’s Inferno outlined the medieval belief of nine circles of suffering that was Hell. 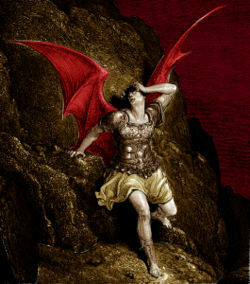 Satan, the angel who tragically fell from heaven in John Milton’s Paradise Lost uttered the now famous lines, “Better to reign in Hell, than to serve in Heaven”. 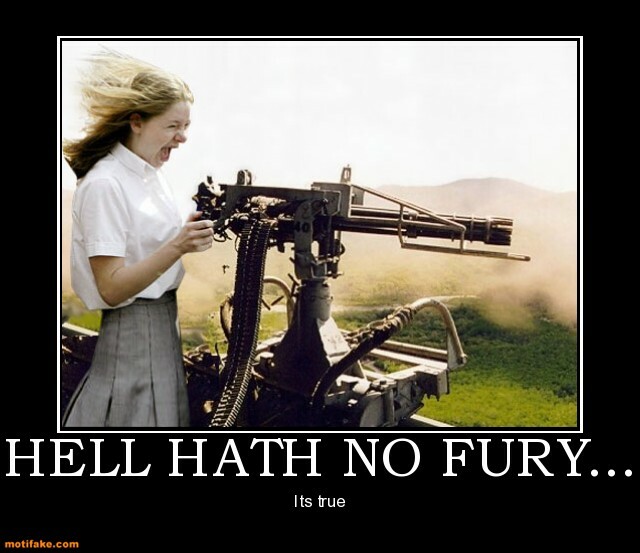 Similarly we have all heard many times that war is hell, and that Hell hath no fury like a woman scorned. These various definitions and versions of Hell may focus on the horrendous and thoroughly nasty aspects men imagine to be Hell, yet they all fall sadly short. No, Hell occurs one week every month when my daughter the Demon Child has her period and I have menopausal symptoms (which for me is 24/7). I figure that my husband plans his out-of-country business trips around these times, since he is never home when the fireworks start. My son has escaped to Ontario where he claims to go to university – of course he’s not just there for the parties and the girls. The dogs cower in the deepest, darkest part of the basement. Me: If you want anything from me, you’d better be nice and talk to me appropriately. I may have been a tiny bit more forceful than this, and I may have raised my voice a wee bit. Her, with eyes flashing, teeth gnashing, and mouth foaming: You’re my mother. It’s your job to help me. After all YOU don’t work. Besides, you yell at me all the time so I’m just treating you the same way you treat me. OMG – she pushed each and every one of my buttons. It was all I could do not to leap across the room …I wanted to wrap my hands around her neck…I saw red…I saw stars…I saw the destruction of mankind as we know it. BUT, I took a deep breath. The Demon Child stomped out of the kitchen and took refuge in the deep dark cave she calls her room. I KEPT MY MOUTH SHUT. Do you any idea how difficult that was??? Especially when I’m SO right and she’s SO wrong?! However, I have finally learned that it is better to stop sooner rather than later. It is better to pick my battles. After all tomorrow is another day. Just don’t get in my way, or it won’t be pretty. 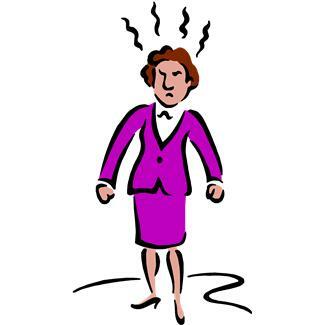 This entry was posted in family, life musings, middle age mama, teenagers and tagged aging, family, humor, kids, menopause, parenting, random, teens by Rita Russell. Bookmark the permalink. You deserve a medal. I don’t want to present it to you though, you might eat my head! Well if you’re nice…maybe just your nose, but don’t worry…usually I don’t bite. Really! Such good advice – PICK YOUR BATTLES, DETACH, DO NOT ENGAGE – I manage to do this about 50% of the time. The rest, of course, isn’t pretty. I don’t know how I’ve missed this post…it is hilarious! We have 3 females cycling in my house so I feel your pain. I really do, haha. I will die when my 2 year old hits 11. For real.